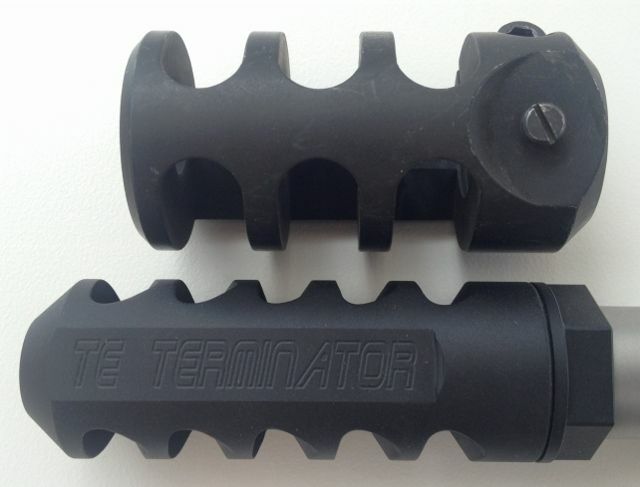 Here is the new TE Terminator muzzle brake. It is self install, so no Gunsmithing required, designed as a direct replacement for the factory Sako TRG, Blaser & Tikka Tactical brake with M18x1 thread. Here it is next to a Sako TRG brake. Here is a performance video. What is the ownership investment Greg? Thanks. I have just invested in a TRG so once I have taken possession and have tried out the Sako brake I will let you know if I want one. The TE certainly wins hands down in the looks department and from the video bolts in in terms of reduced recoil. Save yourself time and go straight to the TE brake. The sako brake is average at best Rushy. Save your shoulder and teeth the rattling and get the TE. just suppress it like mine it's awesome! I have the brake as well but just abhor the noise and percussion that comes with it. I can send it up if ya want to try it for a few shots. bugger all recoil and noise equals happiness! Which brake to you have Andy ? I have the trg brake but I hate them all evenly. yours is the most effective I have used but just over all them so no offence intended! How heavy is your TRG with the suppressor & which projectiles are you shooting ? it's heavy but it is a bike and gong gun so way more user friendly at the range and not seaching for hearing protection when panicking at the bike as generally have a spotter that would need protection as well. and shooting the a max of course until I run out then the eld-x if they work? Thanks for the offer Andy. The TRG I have brought comes with a Hardy suppressor but I have a personal preference for loudeners. I have had the full muzzle blast of my 300 WinMag.